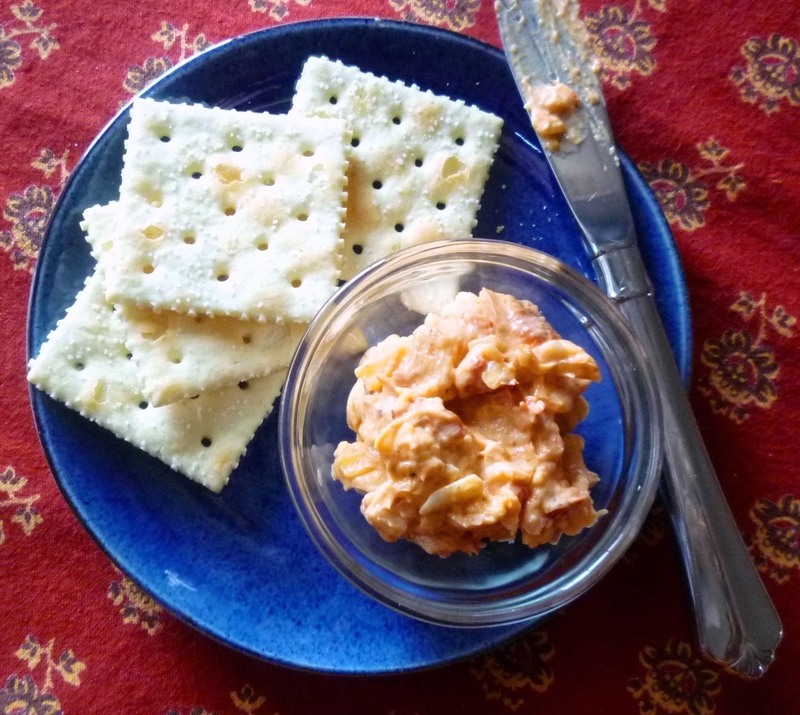 Pimiento Cheese was always a part of my maternal grandmother's Thanksgiving Day relish tray. Stuffed into little celery sticks, it—along with the watermelon rind pickles—was high on my list of things to avoid. My dad loved it. Not because it was any good—I think my maternal grandmother was purchasing hers from the grocery store deli counter by the time I came along. Rather, I would bet my dad's enjoyment of said substance rested in nostalgia...for the delicious homemade pimiento cheese that his mother apparently made when he was growing up. I still think there are better crudités than celery sticks...but I have learned to love pimiento cheese....the real (homemade) thing, that is. 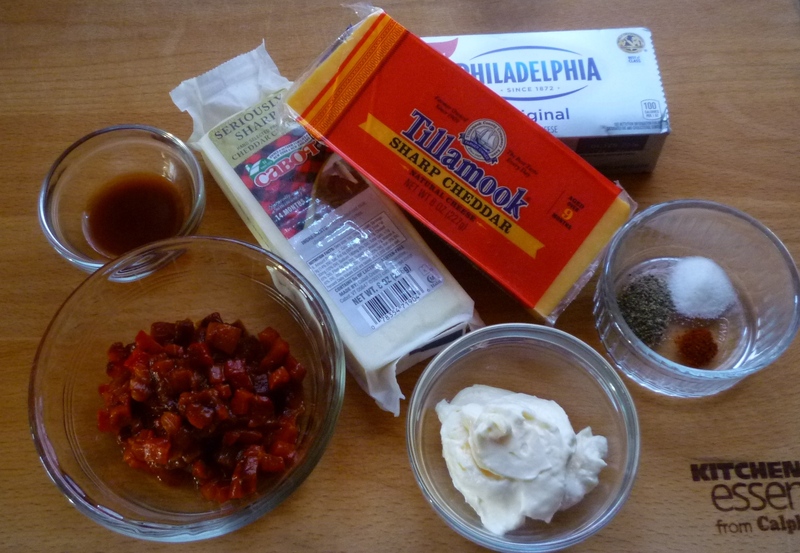 My first inkling that there was something to love about pimiento cheese came around Thanksgiving of 1999. In the November issue of Gourmet that year, James Villas wrote a wonderful little ode to his mother's version. I was intrigued. He made me want to try it. But I chalked this up to fine writing and went along in my pimiento cheese avoiding ways. Then, several years later I received a copy of southern chef Frank Stitt's first cookbook. Stitt is one of my favorite chefs. 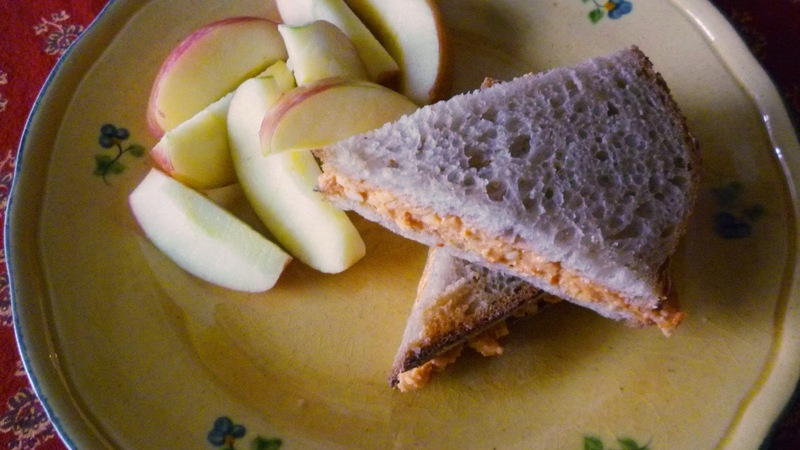 And the fact that he thought highly enough of this traditional Southern dish to give it space in his first book (along with even more space to write his own short ode to the stuff) gave me pause: Perhaps there was something more to pimiento cheese than nostalgia? So I made a batch. What can I say? I get it now. It is addictively delicious. 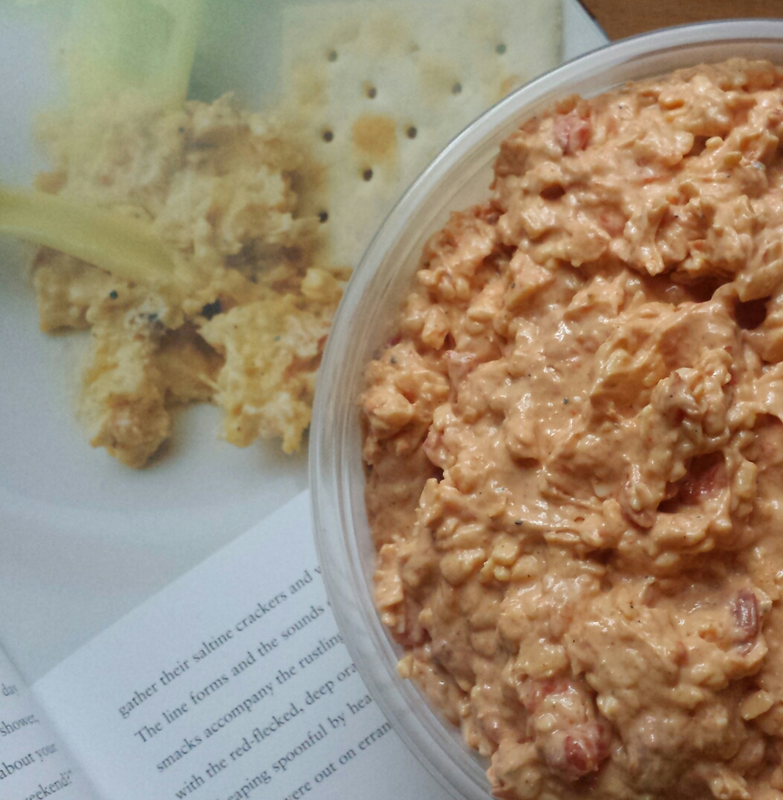 I have continued to make Frank Stitt's version of pimiento cheese. There are other versions...but this one is extremely good. And it includes what I think (as a non-connoisseur) are the important elements. First and foremost you need a good, sharp cheddar cheese. Villas recommends New York and Vermont Cheddars, but any delicious, well-aged cheddar that you love would be good. I use a mix of Sharp Oregon Tillamook and Cabot's "Seriously Sharp" White from Vermont. Next, you need excellent mayonnaise. I like Hellman's...but if you're from the south, Duke's is apparently the only way to go. You can obviously make your own too. Good mayonnaise will add zip and tang...and lovely texture. Stitt's version substitutes a little bit of cream cheese for some of the mayo. (Make sure that these two are smoothly creamed together before adding anything else.) I think the cream cheese is a nice touch. But it is possible that an aficionado would consider this heresy. Stitt's recipe includes freshly roasted peppers instead of jarred pimientos. James Villas would give him some disagreement on this point...evidently feeling very strongly about the inclusion of jarred pimientos. But I can't imagine a jarred product could compete with the firm texture and sweet—slightly charred—flavor of those you roast yourself. Villas adds further weight to his argument in favor of jarred pimientos by pointing out that the liquid in the jar is the perfect medium for correcting the consistency of an overly stiff pimiento cheese. But again, I can't begin to believe that this liquid could hold a candle to the sweet and robust flavor of the juices exuded by freshly roasted peppers. Lastly, pimiento cheese should have a nice kick. Stitt's version provides this with a generous amount of freshly ground pepper, cayenne and hot sauce. Stitt uses white pepper...but I prefer black. I love the look of the little flecks throughout. I don't use hot sauce...finding that the black pepper and cayenne give plenty of heat. But you can...and should....make it as zippy as you like. You may grate the cheese coarsely...or finely...as you prefer. I like it coarse. 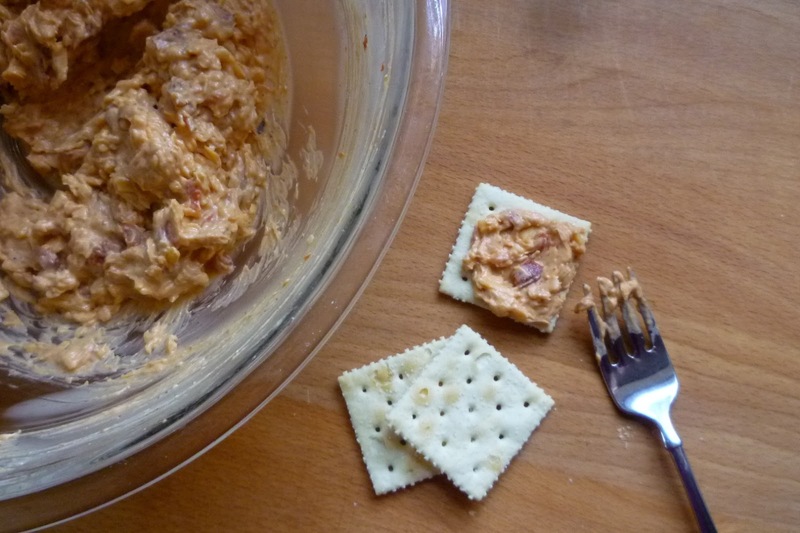 I discovered during a recent Facebook conversation that many people who grew up with pimiento cheese remember their mothers grinding the cheese through an old fashioned, hand crank, meat grinder. When I looked up Villas' article in Gourmet, I discovered that this was the way his mother made it too. My own mother—seeing the Facebook conversation—told me that the meat grinder was my dad's mother's implement of choice as well. Before I finish, I feel I should point out that the inclusion of half a package of cream cheese in Stitt's recipe turns out to be a bit problematic for me. Cream cheese is not something I eat a lot of. Other than in pimiento cheese I only use it for a couple of things: cheesecake and cream cheese frosting. Most recipes call for 8 oz. increments. So unless I am making a double batch of pimiento cheese, I end up with half a package of cream cheese taking up space...and eventually going bad...in my refrigerator. This time though, I decided to try and use it up before I forgot about it. 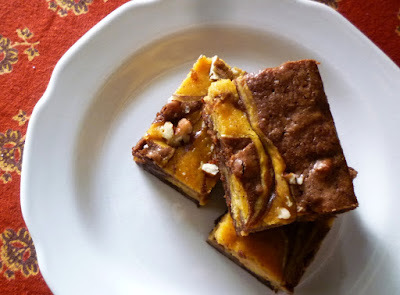 As I considered what to make, the Marbled Peanut Butter Cheesecake Brownies I made last March immediately came to mind. They use exactly 4 oz. of cream cheese. More importantly, they were delicious. It occurred to me that a seasonal pumpkin version would be a fine thing too. And it was. 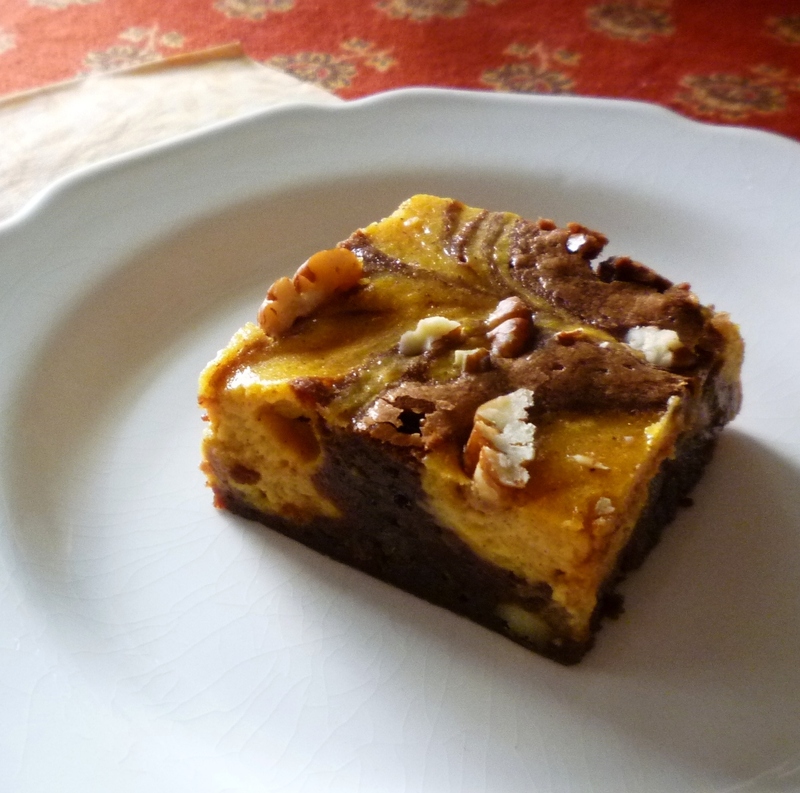 I'm including the recipe so you won't be stuck with that half package of cream cheese either. I hope that if you have spent a lifetime avoiding pimiento cheese....or if you have never heard of it until today (if you don't have Southern roots, you might not have)...that you will give it a try. Thanksgiving Day...in a nice big bowl, surrounded by saltine crackers (and celery sticks, if you like)...would be the perfect time. I don't imagine that there will be any leftovers....but if there are, it makes a fantastic sandwich. Butter an 8-inch square baking pan. Line the pan with parchment paper allowing the parchment to hang over the edges on 2 sides. Butter the paper. Flour the pan and set aside. Preheat the oven to 350°. In a medium saucepan, over low heat, melt the butter and the chocolate. Set aside to cool for a moment or two. In a large bowl, whisk the eggs just to break up. Whisk in the sugar and the vanilla just until smooth. Whisk in the salt. Stir in the cooled chocolate-butter mixture. Sift the flour into the bowl and fold in. Fold in 2/3 of the pecans (1/2 cup). Spread the chocolate batter in the prepared pan. Dollop the pumpkin-cheese mixture evenly over the chocolate batter in 9 equal portions (a miniature ice cream scoop/cookie scoop works well for this). Smooth the dollops slightly so they are more or less level with the chocolate batter. Marble the two batters together. Scatter the remaining pecans over the surface. Bake until a toothpick comes out just clean—about 30 to 35 minutes. Cool completely. Chill before cutting into small rectangles or squares. Makes 16 to 24 brownies.